A general view of Philips Arena next to the CNN Center in downtown Atlanta. Super Bowl LIII will be played in Atlanta at the Mercedes-Benz Stadium on Sunday, Feb. 3. While the new stadium is an attraction in itself, see the list below for other sites in the area for you and the family to visit while you wait for the New England Patriots and Los Angeles Rams to kick off. Atlanta is home to the largest aquarium in the United States, with more than 100,000 animals swimming in over 10 million gallons of water. General admission tickets range from $28.95 to $35.95 depending on the day, but there are discounts for those who show up before 11 a.m. or after 4 p.m. This award-winning museum highlights the civil rights movement in the south and country as a whole. Open every day until 5 p.m. (with the last entry accepted at 4 p.m.), kids under 6 are free while adults pay $19.99. The High is the largest art museum in the southeast. Regular admission is $14.50 for guests 6 and above, and free for children 5 and under, but tickets to its highly-rated Yayoi Kusama: Infinity Mirrors exhibit that runs through the first week of February must be bought separately (and they sell out fast). This 30-acre botanical garden is located next to Piedmont Park in Midtown and features events and exhibits throughout the year. Kids 3 and under are free, while tickets for kids 3-12 are $20.95 and adults pay $23.95. This interactive museum is devoted to all things college football. Though the Skill Zone will be closed for Super Bowl weekend, fans can still get a tour of the exhibit. Click here for prices and availability. You can learn the history of the Atlanta-based Coca-Cola Company at this 20-acre complex (and try a few free sodas while you’re at it). General admission tickets range from $13-$17, while toddlers are free, but VIP guided tours are also available. Located down Auburn Avenue, this site gives you an up-close look at the life of Martin Luther King Jr.’s life in Atlanta, from his childhood home to the church he and his father pastored. Did we mention that it’s free? Bikers and pedestrians flock to the Atlanta Beltline for exercise and awesome views of the city. Here, you can take a stroll, grab a bite to eat at Krog Street Market and see some beautiful artwork. 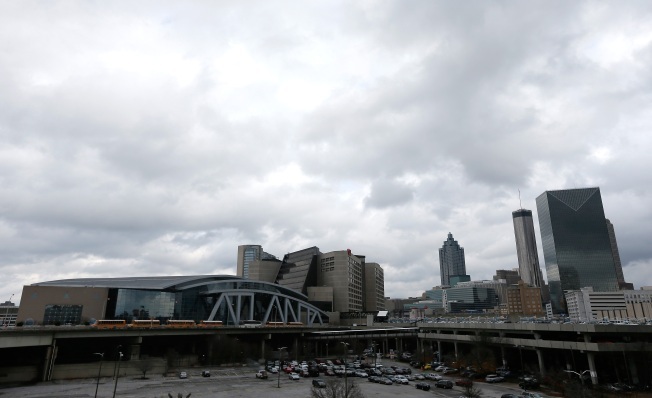 This 22-acre public park located in downtown Atlanta was home to the 1996 Summer Olympics. You can see the Fountain of Rings, take a ride on the SkyView Ferris Wheel or attend one of the many concerts happening for Super Bowl LIVE.